The Westland Whirlwind first flew in November 1952 and was a licence built version of the Sikorsky S-55s with it's engine upgraded to the more powerful Alvis Leonides Major twin row radial piston engine, from 1958 a Gnome turbo-shaft engine was fitted further increasing performance. Westland Whirlwinds remained in service with the RAF until eventually replaced with the Westland Wessex. 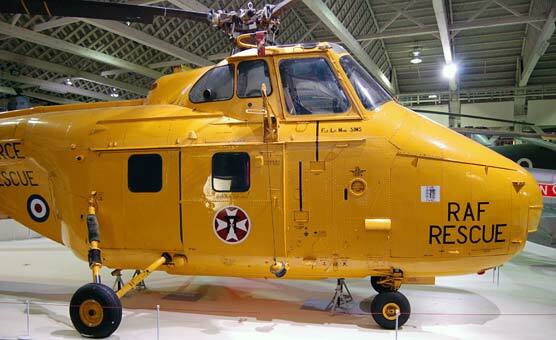 The HAR 10 was the military rescue version of the Westland Whirlwind. Unless otherwise stated these pictures of a Westland Whirlwind helicopter are Copyright © June 2014 Siteseen Ltd. We only authorise non-commercial picture use and particularly encourage their use for educational purposes. These Westland Whirlwind pictures are not in the Public Domain. 3) Use of this Westland Whirlwind HAR10 picture, or any of our pictures on websites re-distributing copyright free material is strictly prohibited.